McDonald's this month announced at a White House event that it would make some changes to beverages marketed to children in Happy Meals. If we want to curb the catastrophic economic and health implications of obesity across the world, we need more companies to follow McDonald’s lead and to step up to the plate and make meaningful changes. I applaud them for doing it. Promote and market only water, milk, and juice as the beverage in Happy Meals on menu boards and in-store and external advertising. That would be a big change if it were true. But it appears not to be true. As Marion Nestle and the Center for Science in the Public Interest (CSPI) later reported, McDonald's agreement with the Alliance for a Healthier Generation reads quite differently from the advertising copy and the Alliance's press release. Instead of saying McDonald's would only "promote and market" healthy beverages on menu boards and in advertising, the agreement (.pdf) actually says McDonald's would only "feature" the comparatively healthy beverages. The agreement explicitly adds that McDonald's may continue to put soft drinks on the Happy Meals section of menu boards. In plain English, this contradicts the company's summary statement. Moreover, a confusing sentence in the agreement appears to say that Fruitizz and Robinson's Fruit Shoot count as compliant with the "CGI commitment," which may indicate that sweetened fruit soft drinks will be treated as juice. Finally, the commitment has a timeline that was not mentioned in the company's ad: it will apply to up to 50% of key markets within 3 years, and 100% of key markets by 2020 (and these key markets themselves represent 85% of all sales). If you think the marketing environment children face today is fine, and you don't believe any major change is needed, the small voluntary changes offered by McDonald's are satisfactory. If you want to see a substantial change in children's marketing environment, it is reasonable to think that these voluntary self-regulation initiatives are far too mild to make any difference, and that the government should take stronger action to protect our children. If you want to see a substantial change in children's marketing environment, but you are skeptical of government initiative to improve things, you should turn to one of the best private-sector tools for defending the consumer's interests -- you should speak up for yourself in every public forum you can. Many sensible parents who prioritize their children's nutrition have simply concluded that nothing but grief comes from patronizing these quick service restaurant companies and their special meals targeting children. Tell your friends and family what you are doing as a responsible parent in your own community. When legislators want to make cuts to the Supplemental Nutrition Assistance Program (SNAP), they don't write in a change to an appropriated dollar amount. Instead, because the program is a "mandatory" or entitlement program, they change the eligibility and benefit rules in some particular way, and then the Congressional Budget Office "scores" the change to provide an estimate of the budgetary change that is generated. When House Republicans proposed this summer to cut SNAP, the particular legislative vehicle was a proposal by Rep. Steve Southerland (R-FL) to increase work requirements. Democrats opposed the change, not so much because of an objection to work requirements, but rather because the proposal was first and foremost the vehicle for SNAP cuts. In the past, proposals for work requirements that weren't about cutting program rolls have sometimes had broad support and sometimes not. In the Washington Post today, Eli Saslow has an excellent feature about Southerland and his interest in work requirements. The article has two especially captivating passages. The first passage is a conversation between Southerland and low-income participants in a job readiness program. I sometimes read a promising reform proposal from a constituency that is not traditionally a core program supporter (whether budget-cutting conservatives, or whether nutrition-promoting public health advocates) and think to myself, "This promising proposal certainly could be strengthened if the sponsors would first vet it with program participants themselves, then make some modifications so that the proposal really could be even more relevant to people's needs, rather than just what an outsider thinks they need." He explained that he had spent the past few days studying 20 years of food stamp policy, trying to differentiate himself from his colleagues by becoming an expert. “Nobody here really knows anything,” he said. He thought about that for a second and then reconsidered. “There’s one other guy,” he said. “A Democrat.” He told her about a Massachusetts liberal named Jim McGovern, who had been giving a speech about hunger on the House floor each week. McGovern had rallied the Democrats against Southerland’s proposal. Out of 435 people in the House, he was the only one who had studied food stamps just as hard and who seemed to care just as much. “What?” she said. “Seriously? Never? That doesn’t make sense.” She knew her dad as a conciliator who valued mentoring young men at church, yearly hunting trips with his three siblings and funeral director retreats to the mountains. “Your whole thing is connecting with people,” she said. “Everybody likes you.” And yet here was another Washington lawmaker, elected to solve the same problems, who had become an expert on the same issue, who worked in the same place, and her dad had never met with him? “That wouldn’t play so well with the conservative base,” Hayes said. “Or back in district,” McCullough said. Now Southerland stretched his arms as far as he could, placing each glass at a distant edge of the table. Each was just an inch from falling and shattering on the ground. This was the congressional divide over food stamps and so much else. This was Washington in 2013 – one place, Southerland was beginning to realize, where legislation depended on so much more than hard work. This totally matches my own impressions about what is going wrong in Congressional politics in the United States on all the important food policy issues of the day. I want to shout, "Take a risk, Mr. Southerland!" You are thinking clearly about important issues. You are getting out in the field to speak to real people. Why, then, restrict your policy conversations to government-hating anti-poor conservatives in the majority caucus of the House of Representatives? Perhaps you have a calling in educating and persuading instinctive liberals about a genuinely helpful vision of a social safety net that gives an honored central place to hard work. Kevin W. Concannon, USDA Under Secretary for Food, Nutrition, and Consumer Services spoke this month at the Friedman School's weekly Wednesday seminar. He gave a broad overview of USDA's nutrition assistance programs and nutrition education initiatives. Kevin W. Concannon has served as President Obama's and Secretary Vilsack's Under Secretary for FNS since July 2009. He oversees the U.S. Food and Nutrition Service (FNS) which serves 1 in 4 Americans, and has lead responsibilities for promoting healthful diet through the Center for Nutrition Policy and Promotion. Working in partnership with State and local organizations, FNS oversees the Supplemental Nutrition Assistance Program (SNAP), formerly known as the Food Stamp Program; child nutrition programs including National School Lunch, School Breakfast, and Summer Food Service Programs; The Child and Adult Care Food Program; the Special Supplemental Nutrition Program for Women, Infants, and Children (WIC); the Commodity Supplemental Food Program; Food Distribution Program on Indian Reservations; The Emergency Food Assistance Program; and other nutrition programs. A video of the presentation and discussion is available from iTunes. USDA's Economic Research Service this month published a delightful set of exhibits for food and agricultural statistics, titled "Charting the Essentials." I especially like the maps. For example, maps using the widely known definitions of "metro" and "non-metro" counties have the disadvantage of obscuring important rural areas within counties that are defined as "metropolitan." 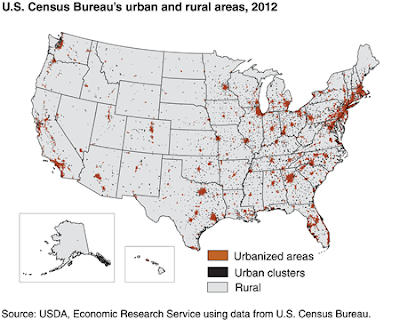 As a remedy, the new ERS chart series provides this nice map of urban and rural areas, with much smaller resolution. Similarly, it is interesting to see the contrast between the comparatively concentrated geographic location of crop production in the Midwest and California and animal agriculture production all over the country. These maps use dot displays for the density of production value. Should federal dietary guidelines address environmental sustainability issues? The federal government revises the Dietary Guidelines for Americans every five years and currently is working on the next revision, scheduled for completion in 2015. Traditionally, the guidelines have focused quite narrowly on nutrition issues, although Kate Clancy, Joan Dye Gussow, and a few others have been encouraging greater attention to sustainability issues in connection with dietary guidelines for many years. During recent times of population growth, changing consumption patterns, and increasingly severe environmental constraints on global food production, it is interesting to ask whether the 2015 guidelines should also address environmental sustainability issues. In May, 2013, the Institute of Medicine (IOM) at the National Academy of Sciences convened The Food Forum Workshop on Sustainable Diets: Food for Healthy People and a Healthy Planet. Former USDA Deputy Secretary Kathleen Merrigan was the keynote speaker. In one session of the workshop, I compared and contrasted the economics of market signals for healthy eating and environmental sustainability. Here is a slightly shortened video of the talk. (As always, neither the IOM nor the Food Forum nor anybody else but me is responsible for any errors I make or opinions I offer). 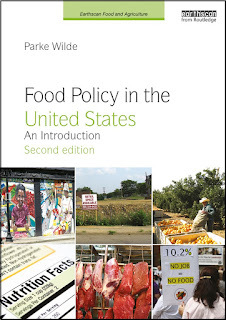 Extensive background material is available in my book, published this year, Food Policy in the United States: An Introduction (Routledge/Earthscan). In some ways, it is easy to imagine the government offering guidance on environmental aspects of food production just as it offers suggestions on nutrition. In another sense, the two issue areas are very different. Here is one difference. Given the trends of recent decades, it is entirely conceivable that Americans will continue to eat badly for ever more. There is no automatic nutritional feedback loop that ensures our eating patterns will some day converge in the direction of greater healthfulness. In the future, we will have healthier nutrition only if we choose to make some change in our current trajectory. By contrast, it is not physically possible for the world's consumers to eat more than the planet can provide. If we continue to seek to exceed the planet's productive resources, there will be a reconciliation one way or another. If we are unfortunate, the reconciliation will involve some manner of crisis, widespread death, and reduced population, until food needs are back in line with productive capacity. If we are fortunate, the reconciliation will involve moderately higher food prices, especially for animal foods and other foods with comparatively high environmental impact. These price increases will lead consumers to temper their excesses while simultaneously sending signals to producers to innovate and invest even more fruitfully in new productive capacity. Whether unfortunate or fortunate, we can no more evade the environmental reconciliation than we can stop the sun from rising. The House and the Senate have not yet agreed on a Farm Bill, but both houses of Congress propose to shrink the role of traditional crop subsidies and expand the role of crop insurance. Crop insurance may sound like a good thing, because it brings to mind an image of market-oriented insurance instruments that ameliorate the production and price risks of farming, much like automobile insurance spreads the risk of using automobiles. However, the reality is far different. Rather than merely facilitating insurance markets with actuarially fair premiums, federal crop insurance policies use taxpayer money to subsidize large for-profit insurance companies. The government subsidies show how a program created to safeguard the nation’s farmers has evolved into a system that in most years all but guarantees profits for insurers. In 2012, taxpayers spent $14 billion paying more than 60 percent of farmers’ insurance premiums, the companies’ operating costs and the lion’s share of claims triggered by a historic drought, according to the Congressional Research Service (.pdf). In research in China on genetically modified "golden rice," Tufts researchers did not provide adequate information to parents whose consent was requested for their children's participation, according to information provided by Tufts University this week. The rice contains beta carotene, a precursor to vitamin A. The research by Tufts professor Guangwen Tang and colleagues studied whether the new rice could make a difference in actual vitamin A status in children. Vitamin A deficiency is a leading preventable cause of blindness in children. While the study data were validated and no health or safety concerns were identified, the research itself was found not to have been conducted in full compliance with IRB policy or federal regulations. Reviews found insufficient evidence of appropriate reviews and approvals in China. They also identified concerns with the informed consent process, including inadequate explanation of the genetically-modified nature of Golden Rice. The principal investigator also did not obtain IRB approval for some changes to study procedures before implementing the changes. The Tufts statement puts to rest the suspicion by some GMO supporters that the criticism of the informed consent procedures was merely an invention by anti-GMO activists or by Chinese officials who had developed regrets about having approved the research. On the contrary, the Tufts statement confirms that informed consent procedures were inadequate. The university announced several changes to human subjects review procedures and will not allow the principal investigator to conduct human subjects research for two years. Dan Charles reported on this controversy for NPR this week. Although golden rice is an important high-profile line of research, I consider the two most important strategies for improving vitamin A status in children to be supplementation and increasing dietary diversity through ordinary fruits and vegetables, neither of which requires GM technology. In a series of blog posts for the National Sustainable Agriculture Coalition (NSAC), Friedman School graduate student Barbara Patterson has been reporting on several aspects of slaughter, processing, and market development for local meat production and sale. Earlier this month, the USDA’s Economic Research Service (ERS) released a report titled “Local Meat and Poultry Processing: The Importance of Business Commitments for Long-Term Viability”. This report follows a related report, published last year by ERS, that evaluated the availability of slaughter and processing facilities for local meat production and the impact on market supply of local meat. The authors of the new report, Lauren Gwin, Arion Thiboumery, and Richard Stillman, reported that consumer demand for local meat and poultry has risen, yet there are constraints on production both due to limited processing infrastructure and, at the same time, insufficient business for processors necessary for profitability. They report, through seven case studies of local and regional processors, that best practices center around long-term commitments by processors to provide consistent and high quality services, and by farmers that commit to a steady level of meat for processing. A second post drew on Patterson's interview with Ali Berlow, author of The Mobile Poultry Slaughterhouse. Ali Berlow, founder of Island Grown Initiative, an NSAC member group, recently published The Mobile Poultry Slaughterhouse, a manual for building a humane, mobile chicken-processing unit. Using her experience establishing a mobile poultry slaughterhouse on Martha’s Vineyard, Berlow comprehensively describes how to adapt her methods to other communities based on their unique needs to ensure an economically feasible production for poultry slaughter. The total number of small-scale livestock slaughter facilities has declined over the past 10 years, despite tremendous growth in total sales of foods direct-to-consumer. Mobile slaughter trailers can help serve poultry growers who lack access to nearby or appropriately-sized slaughterhouses, as well as helping processors maintain a stable volume of business, necessary for economic success. Berlow described transparency and community as the keys to a successful slaughterhouse. “When you engage the community, it helps them to know where their food is coming from and the difficulties and challenges that come with that.” One such difficulty, complying with local, state, and federal regulations, can only be helped by more community engagement and outreach to local and state regulators, according to Berlow. Today’s New York Times has a terrific news story about this frontier of research by their reporter Michael Moss. Moss just released a lively new book about how food manufacturers raise the levels of salt, sugar, fat and other ingredients in processed foods far beyond what you’d add in your own kitchen, while research at Tufts and elsewhere has shown similar problems in restaurant food. In contrast, grocery stores sell a lot of fruits, vegetables and other relatively healthy stuff, generally around the perimeter of the store. So, in the choice between processed foods, restaurant foods, and plain old groceries, what determines how consumers’ spend their hard-earned money? Part of the answer is advertising. I imagine other key factors are consumer tastes, demand for convenience, prices, and overall health orientation. The comments to Will's post are interesting. Will, incidentally, this year won the prestigious Bruce Gardner Memorial Prize for Applied Policy Analysis from the Agricultural and Applied Economics Association (AAEA). Danielle Nierenberg and Anna Glasser at Food Tank this week listed Food Policy in the United States: An Introduction as a "must read" book for fall 2013. Food Tank: The Food Think Tank was founded by Nierenberg (a graduate of the Friedman School at Tufts) and Ellen Gustafson. This video lays out the initiative's objectives.